A few weeks ago I cut down a birch tree and split up the best of it to add to next winter's firewood. Since then it snowed a couple of times, and it rained a bit. A few freeze/thaws had the tangled tops of that tree buried and frozen to the ground. Things are warming up now and the snow is disappearing so yesterday I pulled those tops from the ground and bunched them up to burn later. This morning I walked out there and flushed two grouse that were nipping on the easy to reach birch catkins. Signs of spring are apparent. A few days ago the temp was barely above freezing – today it hit 60. I ate lunch in the sun. There was a robin in our yard. I saw a butterfly flitting about. Water is running down the driveway. It's easy to track mud into the house. I found two deer ticks on my dog. In town folks are happy and smiling even when dodging the pot holes in the street. Young guys are driving around in jacked-up trucks with the windows down and the heater and CD player running wide open. My friends are sending pics of boats and newly tied flies, eager for the fishing. I'm excited about the wooden bass poppers I made this winter and can't wait to try them. Some steelhead are being caught down near Lake Superior. I've always said home is my favorite place to be and it would be sad if it were otherwise. But I have some other favorites for when the time is right and I'm looking forward to seeing them. It was a tent camp about 30 miles north, trying to get a couple of setters ready for the spring field trials. A tent pitched, dogs staked out, stone fire ring and lantern hanging from a cut pole tripod. That's what the old photo shows. It was the same time of year as it is now. 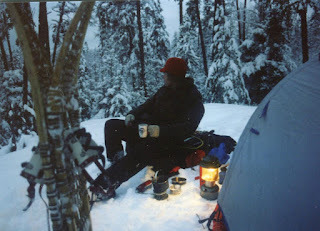 We'd work native ruffed grouse and woodcock during the day and in the evening I'd sip whiskey with the dogs for company and listen to howling wolves. There was no snow. Today when I stepped off the packed trail I sank almost to my crotch. I like winter in it's time and I have the equipment and gear to enjoy it. I like big, juicy cheeseburgers too, but that doesn't mean I want to eat them everyday for six months. It's still winter here but the days are getting longer and I'm thinking about fishing like I do every year about now. A month ago a whittled willow bass popper was interesting to make. Then a dry cedar branch was found and now there are a few wooden poppers ready to knot onto a leader when the time comes. On those evenings when I get to wondering where most of my life went when I wasn't looking, I can close my eyes and picture the wake of a big fish behind one of these poppers and be excited for what's ahead. It's so cold now the Postal Service has canceled mail delivery for today. I haven't heard of that happening before, but considering what most of the mail consists of I often wish I'd never get any. Still though, USPS does a good job at bargain rates. I can tell you, if you hired me to take an envelope across the country it would cost you a heck of a lot more than a stamp! The last few days we've awoken to temps ranging around 35 below zero, give or take 5 degrees. Daytime highs reaching 10 below, but with the biting wind dramatic weathermen are warning us all to take shelter. Schools, of course, have been closed for a couple of days and some businesses in town have shut the doors, also. But it's been fine for splitting wood with my 8-pound splitting maul – those frozen blocks of wood pop open easily when I hit them. It's said firewood warms you twice, once when you make it and again when you burn it and working out in the sunny, frigid mornings is a pleasing way to start the day – maybe the best way to avoid cabin fever is not let it take hold in the first place. When your cheeks start burning and your fingers are too numb in mittens to hold the maul it's time to go indoors and you won't need a TV weatherman to tell you so. Up here we get plenty of sub-zero winter days and it's a given that indoor projects like fly-tying keeps us in the right frame of mind thinking about tomorrows to come. I cut a branch from a dying willow a while back just for days like this. With knifes, files, and sandpaper I'm shaping a couple of wooden poppers. Just to do something different I sawed a disc from the front of one and hollowed it out with drill and dremel before gluing the disc back on. I can't say if that will accomplish anything but it was interesting to do. After I glue the hook into the groove filed into the bottom I suppose I'll paint some kind of frog pattern on it. The other I think I'll leave natural and finish with the same spar varnish I use on my snowshoes – but I'll have to wait for warm weather for that 'cause that varnish stinks to high heaven and not fit to open in any building inhabited by humans or critters.